The recent days have brought their amount of new experiences. Yesterday going to the Takamatsu memorial with sensei was a nice moment that I always cherish, and it is was a true moment of budô shared with sensei, Oguri senei’s family and a group of shihan from all over the world. I am always thankful to sensei for these rare opportunties unveiling another true aspect of his budô. This is the proof, if needed to, that the bujinkan is a Shindô – 真道, a true path of Life. We stayed in Tsukuba for a few hours and burnt incense sticks in memory of Takamatsu sensei and Oguri sensei. 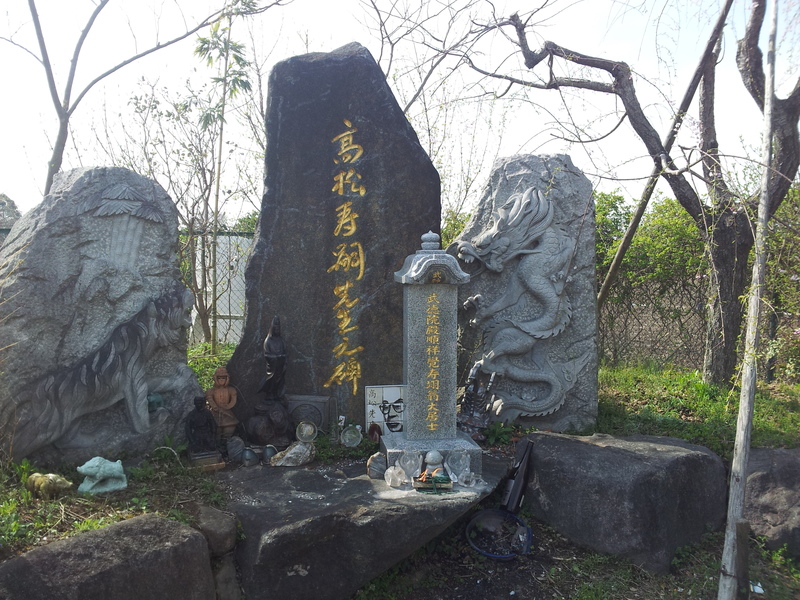 After we finished sensei asked us to rebuild a statue that fell and broke into pieces after a recent earthquake. Nagato sensei, Moti, Darren and a few others repaired it and put it back standing up on its piedestal. It is a statue of a woman pouring water like the zodiac symbol of the Aquarius. For me, it was a symbolic lesson concerning life and hope. This “aquarius” woman lying on the ground and destroyed was suddenly raising again and standing up for a better future. In budô, we often fall (ego, illusions, self pity) but each time we rebuild ourselves and stand up again. This is what perseverance is about. The fact that we are at the end of the era of the Aquarius adds even more meaning to the scene as if telling us that untill the end there is always a need to be living in the present. Too many people are heading towards a potential future and do not take the time to enjoy the present moment. In the techniques this is obvious as uke is already moving in his future and is not able to react correctly in the present. I began to see the links with sensei’s past teachings coming together in a single space and time.The concepts of nakaima (the center of now), henka (the begining and the end of change), and juppô sesshô were dancing together and melting in my brain. This was indeed a very special day. I understood suddenly that all the teachings I had received in the past 28 years were summing up into one single idea: being one with oneself to live happily in a permanent present. Then, back to Noda I met with sensei at his home. Shiraishi sensei was struggling with the many orders received recently, and the floor was covered with enveloppes, papers, diplomas, patches and membership cards. The bujinkan has become a big organization today but as sensei wants to keep it human, it is not run like a business. I want to take this opportunity to thank Shiraishi sensei for his hard (and unrecognized work) in dealing with hundreds of orders during his free time. I also want the bujinkan community to understand the huge amount of work it requires from both Hatsumi sensei and Shiraishi sensei. The bujinkan office receives about 15000 orders per year (my guess). These orders concerns: membership cards, patches, shidôshi hô menkyô, shidôshi menkyô, kyû ranks, dan ranks up to 4th dan, and shidôshi ranks from 5th dan to 15th dan. Shiraishi sensei has to control every order in the bujinkan logs and prepare the various orders until fourth dan. All menkyô diplomas and shidôshi ranks are done by sensei. Sensei told us last week that there were now over 3200 shidôshi in the bujinkan! If you consider that an average order takes 5 minutes you get an impressive total of 1250 hours of work. Shiraishi sensei is helping sensei around 20 hours per week to do this, so I hope that you now understand why it takes so long between the day you send your order and the day you receive it. An average of 8 to10 months is therefore logical. Even though those “papers” might have some importance, remember that what you are learning is not on this piece of paper with your rank on it, it is on what you do with yourself and that will take more then 8 to 10 months to achieve your mission in budô. Time is an illusion and the path is long, and this shindô will transform you more than you think. But you will understand this only after training 30 or 40 years of real training. Previous Post Confused? Not Anymore!